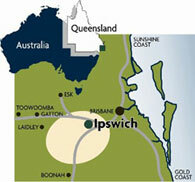 Ipswich is centrally located in the booming South East Queensland region of Australia. To the east is the capital city Brisbane, and to the west are the rural and agricultural areas of the Brisbane, Lockyer and Fassifern Valleys. The city is ideally positioned on the national road network - 40 minutes drive from Brisbane, an hours drive from the Gold Coast and 60 minutes drive from domestic and international air and sea ports. Ipswich comprises an area of 1090 square km and has a population of 210,000 people. Ipswich enjoys a subtropical climate and is a safe, friendly and multicultural city. Residents come from 163 different countries, speaking 152 languages. As Queensland's oldest provincial city, Ipswich has a rich history. It is renowned for its architectural, natural and cultural heritage. Ipswich proudly preserves and still operates from many of its historical buildings and homes, with more than 6000 heritage-listed sites. Ipswich also has a range of charming townships within the western rural areas of the city, each with its own legitimate claims of historical significance. Ipswich is an exciting place to live, work, invest and visit. Education plays an important role in the local economy with two universities and a wide choice of private and state government schools. Art lovers will delight in the Ipswich Art Gallery and the Workshops Rail Museum is a rail enthusiast's dream. If you fancy a bird's-eye view of the Ipswich region, enjoy the best vantage point from above with Floating Images Hot Air Balloon Flights or a Pterodactyl Helicopters tour. Visit the luxurious Spicers Hidden Vale mountain retreat for a bit of pampering or to host your wedding or get the whole family to the Hidden Vale Adventure Park for a bit of action. Ipswich hosts regular national and local festivals and events such as the Queensland Open Golf Championships, the annual major horse race the Ipswich Cup, drag-racing's finest at the Winternationals held at Willowbank Raceway, Queensland 400 V8 Supercars at the Queensland Raceway, the Ipswich Festival and the Ipswich Show. Ipswich is alive and leading the way in tourism, sport, industry, technology, education and residential development.